We can’t think of any place we wouldn’t wear this 100% cotton crew World’s Speed Shop T-Shirt. The back features a bold red background with a classic roadster parked at The World’s Speed Shop. Available in men’s sizes M-3XL. Show some Summit pride with this cool large print graphic T-Shirt with the year of establishment, 1968, centered on the back. Available in men’s sizes M-3XL. Cardio isn’t the only way to get your heart kicking. 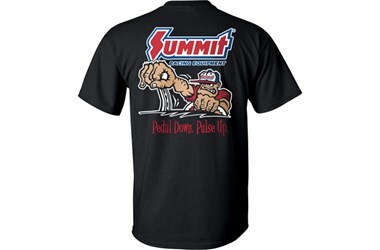 Adrenaline junkies everywhere will love this Summit Racing caricature’s full-fisted throttle hand and lead-foot-loving attitude. Available in men’s sizes M-3XL. Step aside Superman. Summit Racing’s laser-cut signs are putting your metal melting abilities to shame. Our 16-gauge steel signs for Hot Rod and Muscle Car Garages are rustproofed and ready to paint, with drilled holes for hanging. The Muscle Car Garage sign is 24" L x 10" H and the Hot Rod Garage sign measures 22" L x 9" H.
Keep your ATV buddies close and your cold ones closer with the Reflective Series 6-Can Drink Tube from QuadBoss. The tube features a closed-cell insulated interior with nylon lining that keeps drinks cold and contained on rough trails. The polyester material is colorfast, UV-resistant, and water repellent, and the cool looking shoulder strap lets you carry beverages backside like a true samurai soldier. Sturdy hook-and-loop straps easily secure the tube to rollcages or ATV racks, and reflective trim makes it easy to find during late-night prowls.